Hampton Creek Press, 9780990694946, 438pp. DRACULA'S GUEST picks up Dracula's story shortly after the conclusion of DRACUL, the iconic prequel to DRACULA written by J.D. Barker and Dacre Stoker. 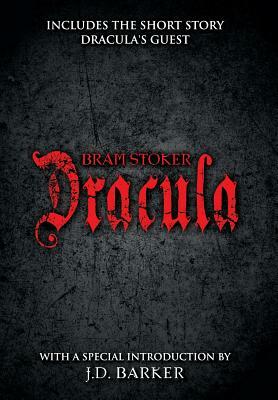 This is followed by the original text of DRACULA--both stories together again as Bram Stoker originally intended. DRACULA begins with Jonathan Harker, a newly qualified English solicitor, visiting Count Dracula in the Carpathian Mountains on the border of Transylvania, Bukovina, and Moldavia, to provide legal support for a real estate transaction overseen by Harker's employer. At first enticed by Dracula's gracious manners, Harker soon realizes that he is Dracula's prisoner. Wandering the Count's castle against Dracula's admonition, Harker encounters three female vampires, called "the sisters," from whom he is rescued by Dracula. After the preparations are made, Dracula leaves Transylvania and abandons Harker to the sisters. Harker barely escapes from the castle with his life . . .
Abraham (Bram) Stoker was an Irish writer, best known for his Gothic classic Dracula, which continues to influence horror writers and fans more than 100 years after it was first published. Educated at Trinity College, Dublin, in science, mathematics, oratory, history, and composition, Stoker''s writing was greatly influenced by his father''s interest in theatre and his mother''s gruesome stories about her childhood during the cholera epidemic in 1832. Although a published author of the novels Dracula, The Lady of the Shroud, and The Lair of the White Worm, and his work as part of the literary staff of The London Daily Telegraph, Stoker made his living as the personal assistant of actor Henry Irving and the business manager of the Lyceum Theatre in London. Stoker died in 1912, leaving behind one of the most memorable horror characters ever created.